ECU is committed to, and places the highest priority on safe emergency procedures for all students, workers and visitors. Emergency procedures have been formulated to meet the requirements of Australian Standard AS3745-2010 – Planning for Emergencies in Facilities. All personnel responsible for managing the emergency process are trained in accordance with the relevant standards. The Campus Support Office on each campus manages the implementation of these practices and procedures. Evacuation exercises are conducted annually so that ECU complies with current legislation and to ensure that staff and students are familiar with the emergency procedures. On the Bunbury campus, it is the Campus Support Manager. They are supported by the ECU Emergency Response Team, consisting of Building and Area Wardens, Security and Traffic Services and other designated personnel. During an emergency, please follow the directions of your Building and Area Wardens and members of the ECU Emergency Response Team. Evacuation procedures for each building, indicating where the nearest assembly areas are located, can be found throughout all buildings. Please take some time to find out where one is located in your building. be aware of the most direct means of exiting their current location. Staff conducting lectures or classes at the time of an emergency are responsible for the evacuation of students under their control – refer to the Emergency Evacuation Management Plan for your campus. In the event of an emergency out of normal hours (8.00am-5.00pm) contact Campus Security on 6304 3333 (3333 from internal phones). Phone 000 and ask for an ambulance. Provide the operator with details of your location and the type of emergency. Then contact Campus Security on 6304 3333 (3333 from internal phones) or pick up any of the Security Phones located throughout all campuses for further assistance. Take direction from Security Officers who are all First Aid qualified. All students and staff are encouraged to familiarise themselves with the "ECU Active Shooter Advice" available as a download on this page.. Phone Campus Security on 6304 3333 (3333 from internal phones). Do not exceed your training or knowledge when attempting to render First Aid. In the first instance, where first aid assistance is sought, the person should attempt to contact a University First Aid Officer in their area. if practicable, Student Health Services will provide routine medical and first aid treatment on campuses where medical suites are located, between the hours of 8.30am to 4.30pm Monday to Friday during University Semesters. Outside of these hours and on Public Holidays, University Security Officers will be responsible for providing this service. In the event that emergency assistance is required after hours and University Security area not available, contact should be made with the local emergency services, by telephoning 000. Note: if you are calling from an internal phone the number is 0 000. An evacuation will occur when an alarm sounds, or if you are notified by Security or an ECU Emergency Response Team Member. Follow the directions of your Building or Area Warden. Leave by the nearest marked exit and take your immediately accessible valuables. Do not use lifts if there is an emergency. Be aware of any persons with disabilities and notify a member of the ECU Emergency Response Team. Once clear of the building, proceed to the nearest and safest Evacuation Assembly Area. Do not return to the building unless notified to do so by a member of the Emergency Response Team. In the event of the need to evacuate from your current location on the grounds of your campus, please follow the instructions of Security or a member of the ECU Emergency Response Team. Ron Stone Park located alongside Bradford Street. Hamer Park or Inglewood Oval located alongside Woodsome Street. Hay Park located at the roundabout, corner of Robertson Drive and Bussell Highway. These areas are approved designated Assembly Areas and your Building Wardens will guide you to which area is to be used depending on the location or type of emergency incident. Contact Campus Security on 6304 3333 (3333 from internal phones) and advise the location of the fire. If trained and it is safe to do so attempt to extinguish the fire. Be ready to evacuate and follow the instructions of your Building or Area Wardens. Close all doors, if possible, to isolate smoke and fire. If the evacuation siren sounds, evacuate the building in an orderly manner. Take your immediately accessible valuables with you. Assist any physically impaired persons to the nearest safe location i.e. the designated fire stairwell. Advise Area Building Warden at the fire panel. Assist anyone in immediate danger if it is safe to do so. 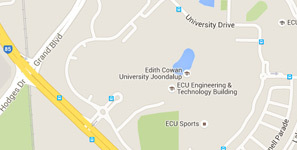 Evacuate to a safe nominated Assembly Zone and await further instructions from the ECU Emergency Response Team. If you find a suspicious object contact Campus Security on 6304 3333 (3333 from internal phones). Switch off office computers if possible and take your valuables with you. Open all doors if possible to do so. DON'T HANG UP (even if the caller does); endeavour to obtain as much information as possible about the threat. Raise the alarm by attracting the attention of somebody nearby who should notify Campus Security on 6304 3333 (3333 from internal phones). If trained to do so extinguish all sources of ignition that could cause an explosion. Walk away from the immediate area and contact Campus Security on 6304 3333 (3333 from internal phones). Evacuate any injured persons to a safe location if it is safe to do so without causing any harm to yourself. Evacuate from the immediate location and stop people from entering into the area. If trained to do so extinguish all sources of ignition. Describe the location of the odour and the odour itself. Cordon off and prevent anyone from entering the affected area. the threat of physical harm to persons or damage to University facilities or property. If any of the above conditions exist, immediately notify Campus Security on 6304 3333 (3333 from internal phones). Security will be responsible for contacting the appropriate authorities, if required. Do not evacuate the building unless instructed by the Building Warden, Security or Emergency Personnel (lifts must not be used). Stay away from windows and glassed areas. Shelter under a table or desk or door frame for protection against falling debris. Don't light cigarettes, lighters etc. as these can create explosions - there may be flammable fumes from damaged containers or gas mains. If instructed to evacuate stay away from - buildings, power lines, poles and trees while making your way to your designated assembly zone. A person with special needs is defined in Australian Standard 3745-2010 as someone having physical, intellectual, visual or auditory disabilities or impairments, either temporary or permanent. This may be as a result of an injury, medical condition or other impairment. Consultation between the warden and the person/s with either a permanent or temporary impaired mobility is essential to ensure appropriate action can be taken for that person/s in the event of an emergency. To ensure safe evacuation of a person/s with impaired mobility a Personal Emergency Evacuation Plan (PEEP) may be required for each individual. Each Plan should be determined in consultation with the person and the appropriate warden. In most cases the generic procedure outlined below will suffice, but it is possible that the person requires a specific evacuation plan due to the nature of their needs. Once a suitable PEEP has been developed, it must be documented and copies stored in the area where the mobility impaired person resides with a copy given to the Building Warden. Anyone with impaired mobility should be guided to a safe location if they are unable to evacuate by themselves. People using mobility aids should only be directed to stairwells for their own safety after the rest of the floor has been evacuated. The Building Warden will allocate someone to wait with that person. The role of this support person is to monitor the condition of the mobility impaired person and if the situation deteriorates, ensure they get assistance. The appropriate warden will communicate to the Building Warden the location of any people with impaired mobility who will, in turn, liaise with the Emergency Services as soon as possible so their safe evacuation can be arranged. The situation may arise where a person with impaired mobility cannot be moved into a designated safe area because of their injury or emergency itself. In this instance the person should be protected as best as possible wherever they are.